This post was compensated by the Boy Scouts of America, but all views are my own. Several months ago I was checking my e-mails and there was one that really caught my eye. It was an invitation to attend a Boy Scouts club meeting. They wanted to know if my son and I could check out their newest pilot program: Lion Cubs, to see if it may be anything he'd be interested in joining. I did a little more research, and learned that the the program is for kindergarten boys who are interested and looking for after-school activities. Five year old children can often join sport leagues and teams, but previous to this piloted program, they weren't able to yet join Scouting. Being a Lion is all about exploration and making new friends. 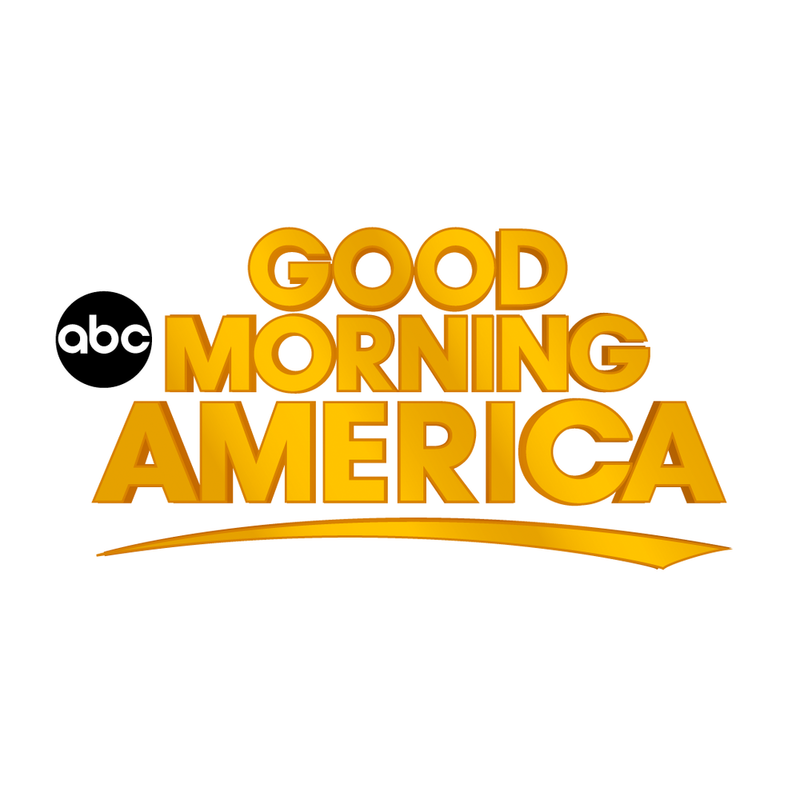 Their vision is to expand imaginations as well as to help spark new interests and creativity. I didn't really have to think twice about this partnership because it was obvious my son would benefit from attending. Weeks before the meeting I showed Pierson some videos and photos of the Boy Scouts and some of the things the boys did and do. 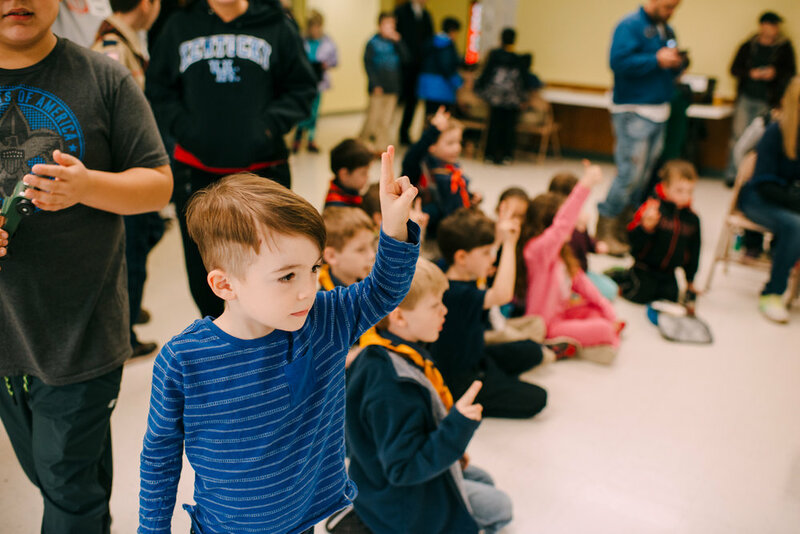 We are friends with some guys who grew up Scouting and they had great stories to share about their hikes, camp outs, and the car races--which my son was SUPER intrigued by. 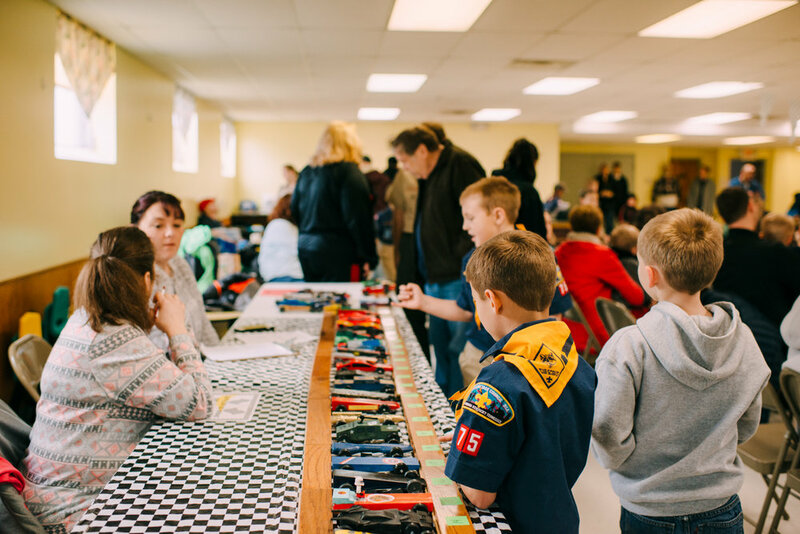 Lucky for us, the event that we attended WAS the car race: the Pinewood Derby, and he loved every second. Dawn, the Cub Leader, was wonderful to introduce us to every person, and to also bring the Lion Cubs around Pierson to share their stories with him. He was completely enthralled; being surrounded by other similar aged peers who were listening well, being attentive, and making him feel completely included, like he was actually one of THEM, how FUN right? 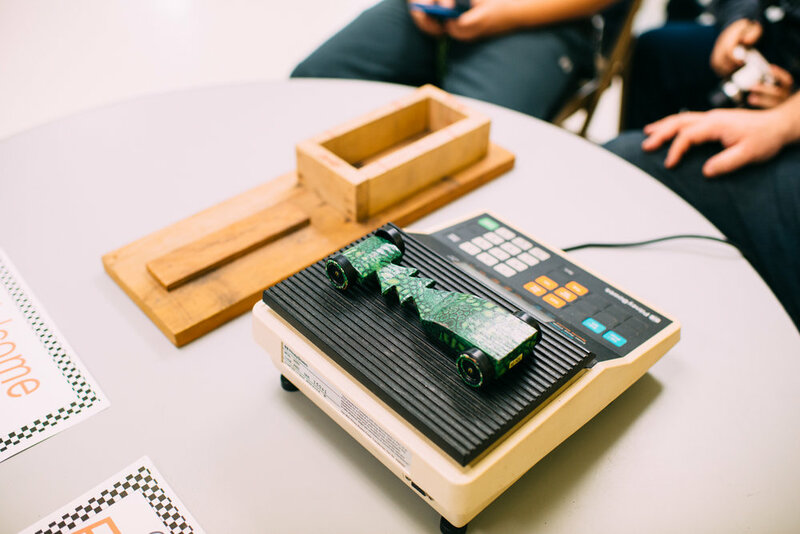 Dawn had a whole box of cars that Pierson could choose from, so that he can try out racing it firsthand. 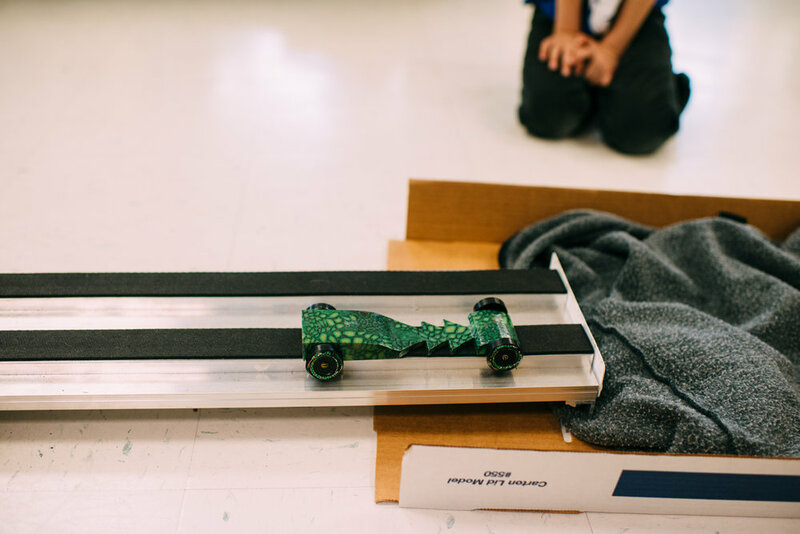 He was ecstatic when he saw the track, and when they let him place it at the starting point, his excitement was so contagious. I mean, here I am, completely new to an event such as this, and I was PUMPED for him to 'race' his car. The Lion Cubs actually surrounded him at one point and cheered him on, even though him doing this was simply for fun. They would actually be the ones participating in the car races, but they were so sweet and inclusive. When the time came for the 'real races,' Pierson was SUCH a trooper about sitting on the sidelines to watch. We did the Pledge of Allegiance and he stood so proudly with the other boys, like he had been doing this his whole life. Do your little ones ever just completely amaze you at their sincerity? Watching him be a part of this made my heart just swell, Y'all. We cheered the Lions on and met some fantastic parents. Pierson went over to the car check-ins and studied every single car with a glimmer in his eye. He was excited, supportive, and was building friendships in the mere hour that we were there! 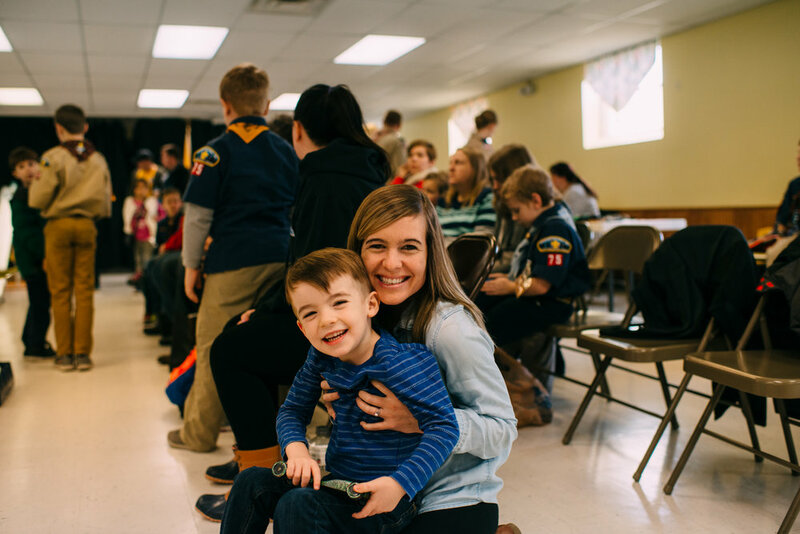 I know the goal of the Scouts is to teach boys courage, compassion, positive attitudes, cooperation, honesty, and SO many other characteristics; and seriously, these were all very evident and sweetly displayed by the boys present. And at the very end, Dawn knelt with Pierson and even gave him his VERY own certificate; he was SO happy! It was very considerate of her to do that, and we are so appreciative of her generous heart. Obviously Pierson and I were honored to go check out this new program, go #scouting, and to see what this was all about! Dawn gave us tons of great resources and helpful information, and we are very strongly considering signing him up in the fall when he starts kindergarten. Pierson came home and told his sister Reese ALL about his afternoon, telling her that "he won" the race and that he had made a ton of friends. Excited is an understatement for how he felt about his day! So we want to say a HUGE thank you to the Boy Scouts for having us, and to the super sweet Lion Cubs who made us feel incredibly welcome there. I think the new Lion Program is a wonderful idea, and they're doing a great job weaving traditional Scouting concepts of character development into these age appropriate activities. If you are interested in signing up for activities, I encourage you to check out your local Cub Scouts or Boy Scouts. You can search here for scouting units in your area. I really don't think you'll regret it! Have YOU been involved in the Scouts? Don't forget to share your #scouting experience on Facebook and Twitter! WELCOME I'm Ashley! A blogger + photographer living in Kentucky with my husband of ten years and two littles. When I'm not writing, snapping photos or chasing the kids around, you can find me baking something sweet while chugging re-heated coffee. Getting married in 2019, or just a fan of my work and want to shoot together? I'm based in Kentucky, available for travel, and currently booking weddings, lifestyle shoots, family sessions + more! Click the button above to get in touch! 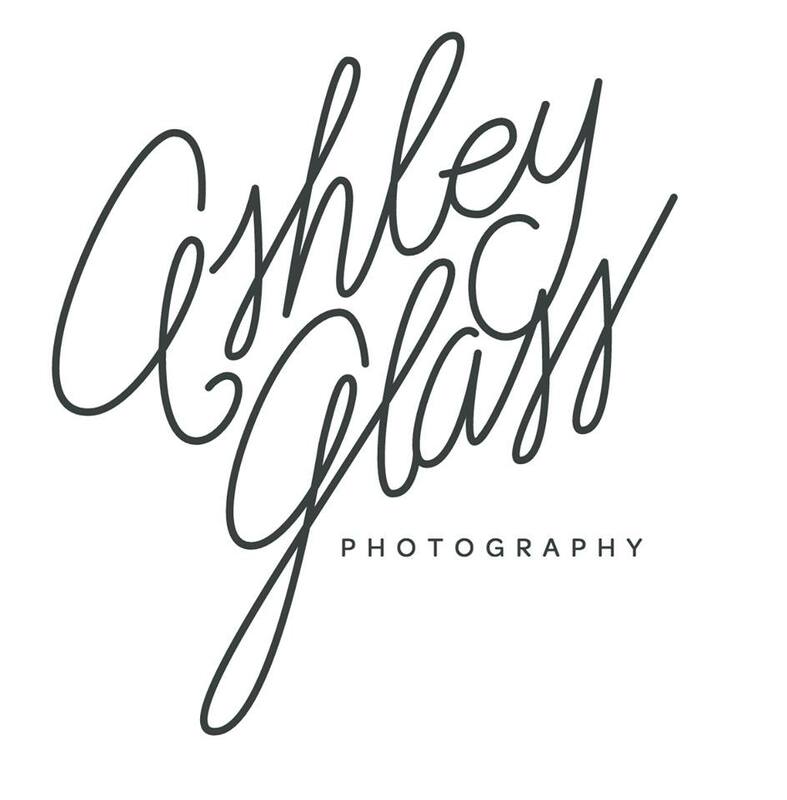 All content is copyright and owned by Ashley Glass unless otherwise mentioned. You may not take images or content from this site without written permission.